I found traces of this article that once appeared on the official Kaman Ovation website, in “our story” section in the first decade of 2000. Apparently the author was Brian Hoover (if anybody can confirm it I’d be glad to give him a sure credit). The article eventually has been removed, so I decided to save it here, to give everybody the opportunity to read it. Who the heck is Charlie Kaman? In 1966, that’s exactly what the music industry was asking. After all, what is a successful helicopter manufacturer doing in the guitar making industry? Anyone who knew Charlie Kaman wouldn’t find this to be odd or unusual. Charlie from early on was a free spirit pioneer. How else could he have built Kaman Aircraft from scratch in 1945 with $5,000 in equipment and $2,000 in cash? In 1965, Kaman Aircraft determined that to ensure company stability, diversification was imperative. They looked at Winnebagos, golf clubs, four wheel drives, even surf boards. Charlie had been thinking about guitars. Guitar playing was a long-time passion of his. So much so, that he entered a Raleigh and Kool cigarettes national guitar contest, became a finalist, and got to play with the legendary Tommy Dorsey band. After the show, Tommy Dorsey offered Charlie Kaman a job as the band’s guitarist. Charlie turned it down. He was committed to being an aeronautics engineer. Having never lost that passion for guitar playing, Charlie saw a natural progression into the guitar making market. Ovation already had mountains of research measuring how helicopters twist, torque and vibrate. They had a couple of intense years of guitar research behind them by 1966 as well. It’s probably safe to say that no guitar manufacturer knew more about vibration, mode shapes and resonances than Kaman engineers. While there was a logical transfer of technology from aerospace to guitar building, the question remained: Would it sound good? This was a radically different instrument. With its composite Roundback design, it was unquestionably the strongest guitar in the world. It was also stunning. The headstock was sculpted and sleek. Understated dot inlays graced an ebony fingerboard. A dark walnut bridge sat in contrast to a light spruce top. All this was married to a slim and fast five-piece laminated neck that, to this day, is a characteristic people still look for in an Ovation. Even the brace pattern, which you can’t readily see, was a thing of beauty. Blues singer Josh White was the first official Ovation endorser. He thoroughly loved the Ovation prototype and the full-bodied sound of its rounded, synthetic back. From that point on, Josh worked closely with Charlie Kaman. Since Josh was a folk player, he was used to playing on a slightly wider neck with 12 frets to the body rather than 14. The collaboration rapidly took the Josh White model off the drawing board and into production. Josh’s name adorned the peghead and the model remained in the line until his untimely death in 1970. In honor of this great bluesman, Ovation is proud to bring back the Josh White Signature model. 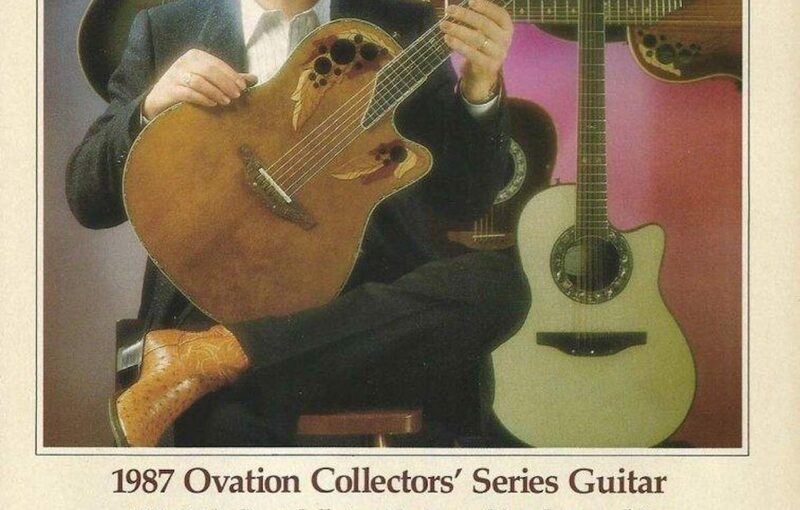 With the Balladeer and Josh White models, Ovation was slowly making its mark. Later in 1967 the Model #5, a 12-string Ovation, was introduced. Now there was an actual “product line” that the relatively young Kaman Music Corporation could shop to music stores. As good as these instruments were — and as great as they sounded — sales to retailers were not so easy. Dealers didn’t know what to make of Ovations. A Roundback guitar might as well have been a UFO. Consequently, they were reluctant to take a chance on stocking the line. However, all of that was about to change. A young guitarist, singer and entertainer by the name of Glen Campbell exploded onto the scene. Though he had a modest pop hit in 1967 with “Gentle on My Mind,” his appearances on the “Smothers Brothers Comedy Hour Show” gave him a shot at stardom. Suddenly Glen Campbell was topping the charts with pop-country crossover standards like “By the Time I Get to Phoenix,” and “Wichita Lineman.” But it was television, not radio, that catapulted his career. In 1968 The Glen Campbell Goodtime Hour show premiered on national television. Glen had it all: the welcoming personality of a boy from Arkansas, all-American looks, distinctive vocals, wicked guitar chops, and an Ovation guitar. Campbell championed the Roundback design (including the shallow “Artist” bowl which debuted in 1968 along with the Glen Campbell model) when all others questioned it. Suddenly it seemed like everyone wanted an Ovation. Retailers couldn’t get inventory fast enough. And the best-known artists of the day were clamoring at the frontdoor of the Kaman Music offices trying to get their hands on one. Indeed, Glen Campbell made a huge impact onthe early success of Ovation Guitars. Acoustic guitars have their limitations in large venues — there’s only so much volume, only so much projection — even with an acoustically superior Roundback design. In the late 60s, getting the sound out to the audience offered two options: step up to a stationary microphone which limited the player’s mobility; or bolt a primitive pickup device onto the guitar’s sound hole which severely colored the sound of the instrument. Neither choice was good. Glen Campbell needed the freedom to move around on the stage of his TV show. Yet he also wanted his acoustic guitar to sound, well, acoustic. All of which put Charlie Kaman and a team of engineers to work developing pickups and preamps that wouldn’t feedback or distort the true sound of the guitar. Glen played the very first acoustic-electric prototypes well before his show ended in 1972. After nearly three years of intense R&D before a televised audience, the production versions of Ovation acoustic-electrics were ready for prime time. Today, Ovation is by far the leader in acoustic-electric guitar technology offering the most sophisticated preamps, piezo pickups, onboard EQ, and microphone imaging available in the industry. More about that later on in the timeline. Unless you’re 40-something or a collector of vintage gear, you may not realize that Ovation once produced solid-body electric guitars. The wheels were always turning in the minds of Charlie Kaman and his team of engineers. All of which netted some truly radical designs. The first to enter the market was the Breadwinner. The body style was reminiscent of a medieval battle-axe but was designed with ergonomics in mind — decades before the word “ergonomics” ever hit the mainstream. Electronically, the guitar utilized state-of-the-art an onboard FET (field-effect transistor) preamp. In today’s terms, that would be known as “active electronics.” To be sure, the Breadwinner was far ahead of its time. A series of other solid-body electrics followed: the Deacon, the Magnum bass and Viper III, and the UK2. Ovation briefly offered a line of superbly crafted semi-hollowbody guitars called the Electric Storm series. But the competitive marketplace in electric guitars from the firmly established brands proved to be too great. In 1983, Kaman Music ceased production of electrics opting to concentrate on the company’s core competency — Roundback acoustic and acoustic-electric Ovations. Paul McCartney liked Ovation guitars a lot. So his wife Linda decided to give Paul a special Ovation for a Christmas present. She wanted the Legend model but asked if Ovation could “dress it up” it for Paul. They did. A hand-selected AAA Sitka Spruce top was surrounded by some 300 pieces of abalone shell that was meticulously hand-inlaid into the body binding. The oak-leaf rosette and the diamond fret markers were graced with abalone shell as well. The back of the peghead had this engraving: “Love from Linda.” There was one other special feature. It was, of course, a left-handed instrument. Paul’s guitar turned out so well, Ovation couldn’t rest with producing just one. So the decision was made to add it to the product line as the Custom Legend. Today you can have a very similar guitar — right or left-handed. Why the Funky Sound Holes on Ovation Guitars? Some ten years had passed and Ovation’s legacy was cemented. Yet given all the success, in Charlie Kaman’s eyes there was still one overwhelming design flaw in all flat-top guitars — including Ovations. The traditional placement of the soundhole put undue stress on the top of the instrument, and reduced the primary vibrating area of the soundboard. What’s more, additional bracing was necessary to keep the top from collapsing under 170 lbs of string pressure. So Charlie, working with his Kaman Aircraft colleagues, set out to redesign the top of the guitar. Technology in aerospace had advanced light years. Materials such as carbon fiber and graphite were becoming the norm in aircraft construction. Applying such technologies to consumer products — specifically guitars — proved expensive, but well worth the investment. The carbon fiber/graphite composite had all the right characteristics. It was light in weight yet strong and resonant like Spruce. Better still, it was impervious to changes in temperature and humidity. The design team developed a sandwich: a thin layer of Birch between two layers of carbon graphite fibers. After experimenting for some time, placing multiple soundholes to the upper bouts of the top proved to improve the sound. Remarkably, at just fifty thousandths of an inch thick, one-third the thickness of a typical Spruce top, the new top offered superior sound — both acoustically and electrically. The guitar with the radical Roundback bowl now had its mate — a space-age top. It was called Adamas-which is a Latin term for diamond. Rare. Special. Coveted. That is perhaps the only way to describe the Collectors’ Series. Produced each year in limited numbers, the Collectors’ Series give Ovation a unique opportunity to launch new technology inside stunning bodies featuring gorgeous appointments and finishes. A few people were fortunate enough to be able preview new preamp designs along with other technical and aesthetic advancements that might someday make their way into the Ovation product line. The concept worked. Every year since the inception of the Collectors’ Series, customers put their names on waiting lists in hopes of securing the next year’s edition. A few lucky collectors own several. Others are still vying for the ones they always wanted yet never obtained. If you’re the latter and happen to possess patience and deep pockets, there is a chance you could get lucky on eBay. Adamas guitars were expensive to produce. The cost of raw materials was astronomical. As was the rocket science that went into developing the instrument. Even the hand-carved walnut headstock and bridge had financial impact. That meant that only a select few could afford one. In an effort to make Adamas accessible to a greater number of players, a slightly less expensive version was introduced — the Elite. The headstock and bridge of the Elite were that of a standard Ovation. The neck was five-piece mahogany rather than the solid walnut neck of the original Adamas. But the most significant difference was the incorporation of traditional solid Sitka Spruce top rather than a carbon graphite composite top. Remember, the original Adamas top was created to increase strength and resonance. It was unknown whether the composite-style multiple soundhole design and unique Adamas bracing would work with a solid wood top. Though the Spruce top was nearly twice as thick, the Elite did indeed sound great. In fact, just to be sure, Charlie Kaman himself tested the first 300 units. Better still, the 1982 list price of $1195 was about half that of the Adamas. Early acoustic-electric Ovations only had a volume control, after which we added a tone control. Turn down the bass and the treble goes up. Simple. A little later on we introduced a stereo version. That was cool, too. But it wasn’t until the introduction of the OP 24 when true graphic equalization was incorporated — separate controls for bass, midrange, and treble. This preamp was nice and warm. Finally players could shape their sound. Believe it or not, this was considered radical technology back in 1985. Since then, a multitude of awesome preamps have come from Ovations genius. Most of the newer preamps are equipped with onboard chromatic tuners and have various tone-shaping controls outside of the standard mid, bass, treble and gain (volume) options. Far too many instrument manufacturers have far too many artist models. Sure, Ovation had the Josh White model. That was 1967. Then they had the Glen Campbell model. That was 1968. Perhaps by 1998 it was time for another. And if anyone was deserving of a signature model is was jazz-phenom Al DiMeola. Al had been playing Ovations since the 1970’s. His guitar of choice was a stock Custom Legend. However he preferred the neck to be shaped a bit smaller than the stock shape. Having altered several Custom Legends for Al over the years, the “DiMeola neck shape” became a well known standard around the factory. Al needed a boost. While on tour with the Super Trio (guitar heros Al DiMeola, Paco de Lucia, and John McLaughlin), egos sort of got in the way with one star wanting to have a bit more volume than the next. One guy would turn up, then the others would follow suit. In an effort to keep stage volume under control, it was agreed that everyone would be equal on stage with equal volume. That’s when Al asked if we could build in a 4db boost switch without the other guys knowing it. So, we gave him a secret weapon. Al would flick on a tiny little button near the upper bout of the neck just when he needed a boost and then flick it off without anyone being the wiser. By the way, the 4db boost switch and the slightly flatter and smaller neck is built into every Al DiMeola Signature model. Melissa Etheridge’s career was on fire. She was playing Elite models due to the fact that they were more affordable. Yes, superstars prefer to pay for what they really want to play. So, having been a loyal Ovation artist for many years, the timing was ideal. Basically, we started with her favorite 12-string Elite and put some spins on it — mostly aesthetic things and a few things electronically. The result was the 1598 Melissa Etheridge Signature model. Melissa was overwhelmed to be held in such high regard with artists such as Josh White, Glen Campbell and Al DiMeola. In 2002, at Melissa’s request, Ovation made a six-string model to support her “Skin Solo Tour.” That model is cataloged as the W597. Ovation’s trained workers, with hundreds of years of combined experience, build guitars largely by hand, with a passion for each instrument. The use of ultra-modern technology supports the manufacturing process, but old world craftsmanship is what is truly at the heart of Ovation. As a result, more than one million guitarists worldwide have chosen Ovation guitars to help them achieve their “signature sound”. Today, Ovation’s latest advancements are available in the new LX Series. They looked at ways to lighten the guitar while improving stability in the neck-especially over the body. They sourced premium woods, added inlaid epaulets, and revamped the bracing to maximize acoustic response. And while all this was moving forward, they designed a new preamp – the OP PRO, based on extensive research and development done in conjunction with some of Ovation’s premier endorsers. New technology and old-world, proven techniques are built into every guitar in the Ovation LX Series.